Alphabet Challenge, E is for........! starts with "E" and one of her cute images! can't come up with anything. If all else fails, you can just open up the dictionary! I've used "Jojo" on my card, and the "E" is for entertainment! I love bright colors, and this certainly is bright! Inside: "Here's your ticket to a fun-filled day! Happy Birthday!" Hope you have fun with this week's theme! 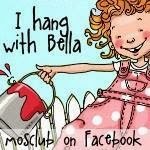 Enter Mo's Challenge for a chance to win a $5.00 gift certificate from Mo's Digital Pencil! 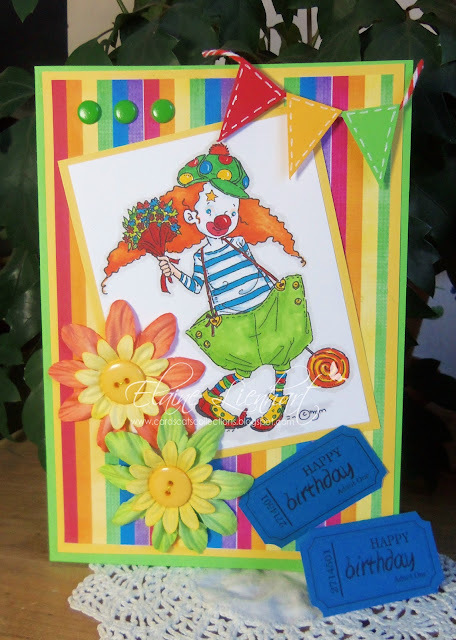 Here's another card with a circus theme! This time I've used the same DP and papers with an image from Sassy Cheryl called "Mama's Little Clown"
I think this image is on sale for $1.00 this week. I'm always glad when you stop by! WOW Elaine! You hit the color jackpot on both of these. Love all the primary shades and the clown theme is really fun. Hugs! 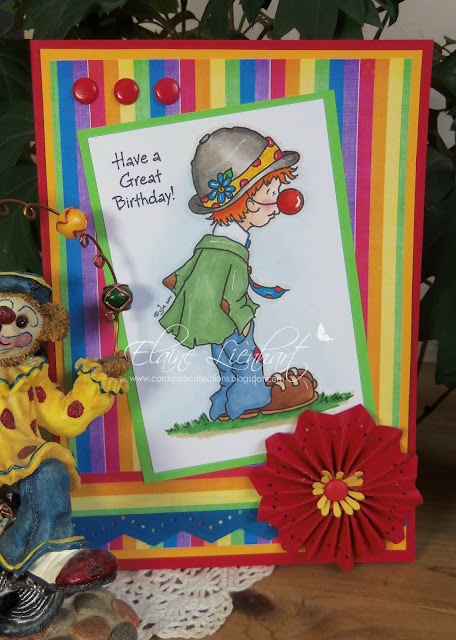 Elaine, this is so fun, love the bright colors and your super cute clown cards. This image is so much fun!! !Love it. Now I want to go to a carnival now- smiles. Color are just fab. Elaine, this is absolutely fantastic! "E" for Entertain ... how brilliant to this with Mo's cute clown. Absolutely love it. It's so much fun to look at your gorgeous and bright card!